The final section of the paper seeks to explain the behavior of several indicators of liberalization in the former centrally planned economies. It presents empirical results that suggest that, in general, the degree of political freedom, the proximity to a thriving market economy, and the size of the underground economy tend to be associated with a rapid process of liberalization. The model estimated in this paper provides a simple explanation for the fact that, in most transition countries, inflation appears to be positively related to price liberalization in the early stages of the transition, particularly in those countries where the liberalization effort was early and strong, while over the medium term the correlation between inflation and liberalization is negative and statistically significant. The paper differs from previous studies in that (1) it introduces explicitly the money supply as a key variable rather than relying on its proximate determinants such as the fiscal deficit; and (2) it examines separately the role of price decontrol and other aspects of economic liberalization such as privatization and trade liberalization. P* = equilibrium level of consumer prices. Equation (5) was estimated using data for 26 transition countries in Eastern Europe, the Baltic Region, Russia and other countries of the former Soviet Union, and Mongolia during the period 1990–96 (182 observations). The regression results are presented in Table 1 and detailed definitions and sources of variables are provided in Annex 1. Equation 1.1 shows the results of estimating equation (5). All the estimated coefficients have the expected sign and are significantly different from zero. 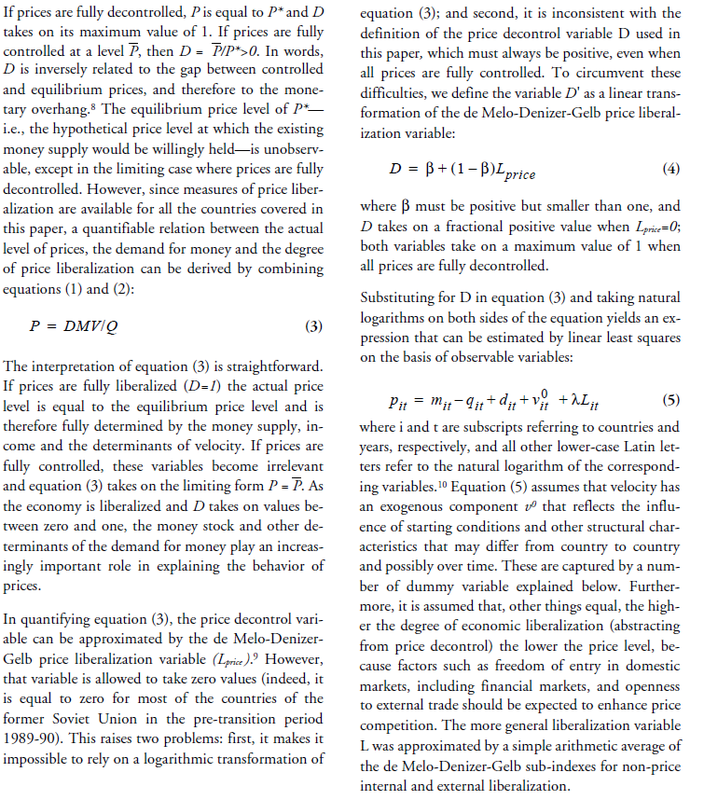 11 Moreover, the estimated elasticities of consumer prices with respect to the money/output ratio (m – q) and the price decontrol variable (d) are not significantly different form unity, which is in line with the model’s basic specification. The coefficient of the non-price liberalization variable is significantly negative as expected, implying that liberalization in general tends to act as a restraining force on prices through enhanced competition and efficiency gains. Equation 1.2. adds a set of four regional dummy variables: for the Baltics, Russia and other countries of the former Soviet Union; for three of the former Yugoslav Republics (Croatia, Macedonia and Slovenia); for the Visegrad countries (the Czech and Slovak Republics, Hungary and Poland); and for the other countries of Central and Eastern Europe. The results suggest that, other things equal, prices tend to be significantly higher in the countries of the former Soviet Union, and significantly lower in the former Yugoslav Republics. However, other results, discussed below suggests these regional coefficients lack robustness. Compared with equation 1.1, the coefficients of m – q and d are virtually unchanged. An examination of the four equations in Table 1 suggests that in general the results are fairly robust. In particular, the elasticities with respect to the money/ output ratio and the price decontrol variable are insignificantly different from one in most equations. The coefficient of the non-price liberalization variable L is always negative, as expected, although its range of variation across equations is wider. Moreover, the coefficients of the regional dummy variables are quite sensitive to changes in specification, although they do suggest that velocity tends to be relatively low in the former Yugoslav republics, and relatively high in the countries of the former Soviet Union. The role of monetary expansion and price liberalization in explaining price movements during the transition is illustrated by Figures 1 and 2. Each chart shows the actual level of consumer price inflation and the level predicted using a first difference form of equation (5) together with the estimated coefficients of equation 1.1. It also disaggregates predicted inflation into three components that reflect the impact of: (a) monetary expansion; (b) price decontrol; and (c) changes in non-price liberalization. The left panels of Figure 1 illustrate the case of two countries that adopted a bold approach to liberalization and also succeeded in bringing down inflation rapidly. In Poland, the liberalization of most prices was achieved in 1990 which, coupled with the impact of relatively rapid monetary expansion in that year, caused inflation to rise into triple digit range. However, as the effect of price decontrol tapered off in the next few years and the growth of money was gradually reduced, inflation declined steadily to relatively low levels. Throughout the period, non-price liberalization had a significant dampening effect on inflation. Price liberalization in Lithuania also occurred at an early stage, and its initial effect on prices was even stronger than in Poland—partly because in 1990 prices were more rigidly controlled in Lithuania than in Poland, where some liberalization had already taken place. In Lithuania, however, both the surge of inflation in 1992 and its sharp decline subsequently reflected mostly the evolution of money growth. 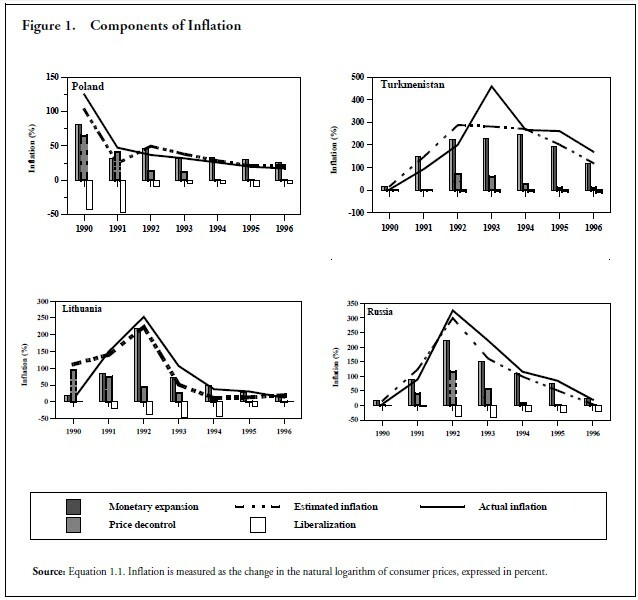 The right panels of Figure 1 compare developments in two countries that allowed inflation to reach high levels but differed sharply in their approach to liberalization: Russia decontrolled most prices in early 1992 while in Turkmenistan prices were liberalized very gradually. In both countries inflation surged in 1992, mainly because of a sharp increase in money growth, although price decontrol also played a significant role, particularly in Russia. After that, however, inflation declined steadily in Russia while it remained at a very high level in Turkmenistan, reflecting a fundamental difference in the stance of monetary policy and, to a lesser extent, a faster pace of liberalization in Russia. The previous sections have examined the impact of economic liberalization, including price decontrol, on the behavior of prices during the transition. This section asks a different question: why have the speed and intensity of liberalization differed so markedly among transition countries? Table 2 shows the main results of an attempt to answer this question by relating the de Melo-Denizer-Gelb price and non-price liberalization14 indexes to a number of economic, political and regional variables. Separate equations were estimated for the price and non-price liberalization variables, although most of the explanatory variables are included in both sets of equations. These variables include the age of the communist regime and the location dummies, both defined in the previous section. The longer the period of communist rule the more ingrained the institutions of a command economy and thus the greater the resistance to liberalization. In contrast, proximity to a free market economy should favor privatization and liberalization in general, by increasing familiarity with markets and markets-related institutions and by providing a demonstration effect. In addition, both sets of equations include a political freedom index, defined to range between -6 for a highly repressive political system to +7 for a free society with the guarantees for individual rights and the institutions normally associated with a modern democracy. It is assumed that the higher the political freedom index the greater the popular pressure for reform. In addition to these political variables, the equations include a proxy for the share of the underground economy, defined as one minus the ratio of officially measured real GDP to electrical power consumption.15 It is expected that a large underground economy should be associated with a relatively low resistance to price decontrol—and to economic liberalization more generally— because it indicates that a large share of the economy de facto has already been liberalized and, correspondingly, that a sizeable fraction of the labor force is interested in the ultimate success of a free economy. Finally, all the equations in Table 2 include a Ruble area dummy equal to one in those years in which a country was a member of the ruble area. The coefficient of this variable was expected to be negative inasmuch as membership in the ruble area often was associated with political interest groups that wished to retain some of the interrepublican ties that existed under the Union and that often opposed reforms. The equations for price liberalization also include the price liberalization gap with Russia, i.e. the difference between the levels of price liberalization indexes in Russia and in transition country i. The larger this difference, the wider (and more widespread) the differentials between relatively free prices in Russia and controlled prices in country i (particularly if that country borders on Russia). Therefore a large price liberalization gap is expected to be associated with intense pressures for price decontrol in that country, so as to eliminate shortages resulting from arbitrage through either legal exports or smuggling. Finally, equations 2.1 and 2.3 report estimation results including lagged dependent variables as regressors to capture the adjustment costs associated with liberalization. Turning to Table 2, all the estimated coefficients have the right signs and are significantly different from zero, except for most of the regional dummies and for the variable measuring the length of the communist period. Also, the price liberalization gap with Russia was vulnerable to the omission of the lagged dependent variable from the regression. The estimated coefficients for the latter variable are roughly 0.6, suggesting a speed of adjustment of approximately 40 percent in the first year. The long-term coefficients in the equations with lagged dependent variables (2.1 and 2.3) can be obtained by dividing the reported (short-run) coefficients by the speed of adjustment, i.e, by 0.4. On that basis, and with the exceptions noted above, the estimated parameters in Table 2 appear to be reasonably robust with respect to changes in specification. Some of the key implications of the analysis are illustrated in Figure 2.16 Figure 2 includes two countries that have achieved a high degree of liberalization. 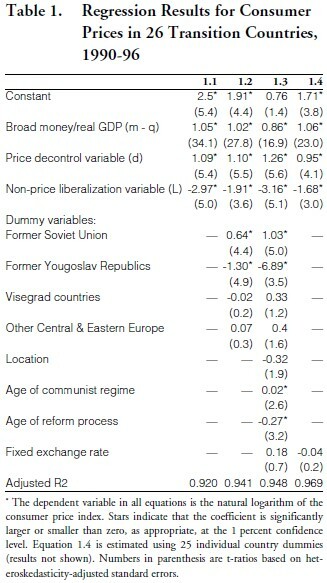 The Czech Republic benefitted from favorable location—outside the former Soviet Union and in the proximity of free market economies like Austria—and therefore the value of its (non-price) liberalization index was already relatively high in 1990, at the beginning of the sample period. 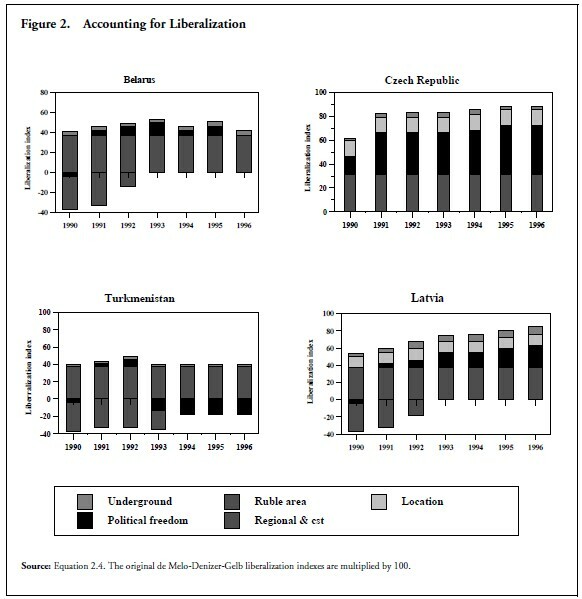 Moreover, an already high degree of political freedom in 1990 increased further during the 1990s, and by 1996 the Czech Republic had attained the highest level of liberalization among the 26 former communist countries included in this study (95). By contrast, in 1990 Latvia still belonged to the ruble area—and, under duress, to the USSR—fared poorly in terms of political freedom, and scored only 5 in the liberalization scale. Over the next six years, however, Latvia’s liberalization index increased rapidly (to 85 in 1996) as the country left the ruble area in 1992, its degree of political freedom increased considerably, and the underground economy expanded. Figure 2 also illustrates the case of two economies where liberalization has made little progress. In the early 1990s, both Belarus and Turkmenistan belonged to the Soviet Union and to the ruble area, they were not geographically close to market economies, and they ranked poorly in terms of political freedom. Not surprisingly, they recorded a low level of liberalization (5, like Latvia) in 1990. Unlike Latvia, however, the indicator of political freedom in Belarus and Turkmenistan remained very low (actually it improved a little in the early years of the transition and then deteriorated) and the underground economy remained very small. By 1996, the nonprice liberalization indexes in these two countries reached only 40 and 35, respectively. On the basis of the results reported in this paper, the fear that price liberalization could lead to an inflationary process appear to be unjustified. Price decontrol will push up the average price level, but it will not have a lasting effect on inflation. In the transition countries, as anywhere else, high inflation results essentially from excessive monetary expansion. The once-and-for-all adjustment in prices associated with decontrol can be very large, particularly if prices had been severely repressed below their equilibrium levels— but that is the unavoidable cost of past distortions. Thus, there are no good reasons not to liberalize quickly, and there are very good reasons to do so: to do away with rationing and queues, and to allow relative prices to provide undistorted signals to market participants, and thus to allocate resources efficiently. But good reasons do not seem to trigger good policies unless there is enough political freedom to allow reason to prevail. D = price decontrol variable; linear transformation of Lprice (two year moving average). F = index of political freedom; from Raymond D. Gastil, Freedom in the World, Political Rights and Civil Liberties, various years (Freedom House). The author provides two scales for each country, one for political rights, the other for civil liberties. For each scale, a rating of (1) is freest, a rating of (7) is least free. Adding the two scales provides a combined freedom rating which ranges between 1 and 14. The freedom variable used in this paper is obtained by subtracting Gastil’s combined freedom rating from seven. It thus ranges between -6 (least free) to +7 (freest). Lprice , Lint , Lext = indexes for domestic price, non-price internal and external liberalization, respectively. From de Melo, Denizer and Gelb (1996a). Updated variables through 1996 were kindly provided by Stoyan Tenev. L = non-price liberalization index; two year moving average of a simple arithmetic average of Lint and Lext..
M = broad money (local currency M2). Derived from end of year percentage changes, from IMF, World Economic Outlook database. P = consumer price index, end of period. Derived form end of year percentage changes from EBRD, Transition Report, 1997. Q = real GDP index, 1989=1. Derived from growth rates published in IMF, World Economic Outlook, 1998; and EBRD, Transition Report, various issues. U = proxy for the size of the underground economy. Calculated as 1 minus the ratio of official real GDP to power consumption. Fixed rate = equal to one when a country is on a fixed exchange rate regime, and to zero otherwise (prorated by the number of months in which the country is on a fixed rate.) Based on information provided by Fischer, Sahay and Vegh (1998), Table 4. Location = equal to one when a country borders on a thriving market economy, to zero otherwise. From de Melo, Denizer, Gelb, and Tenev (1997). Age of communism = number of years during which a country was under communist rule. Equal to the difference between 1990 and the following years: 1948 for Bulgaria, the Czech and Slovak Republics, Hungary, Poland and Romania; 1946 for Albania; 1945 for the former Yugoslav republics, Moldova and the Baltic countries; 1924 for Mongolia; and 1918 for the other countries of the former Soviet Union. Age of reform = equal to the current year minus the first year of substantive reform, the latter being defined as the first year in which the de Melo-Denizer- Gelb aggregate liberalization index reached 0.1 or more. Price liberalization Gap with Russia = For each country, the difference between the price liberalization variable for Russia and the price liberalization variable for that country. Visegard countries = the Czech and Slovak Republics, Hungary and Poland. Other Central and Eastern Europe = Albania, Bulgaria and Romania. 1. The views expressed are those of the author and not necessarily those of the International Monetary Fund. 2. See Carranza, Gutiérrez, and Monreal (1997) and Hernández-Catá (1997) for two different views on this issue. 4. 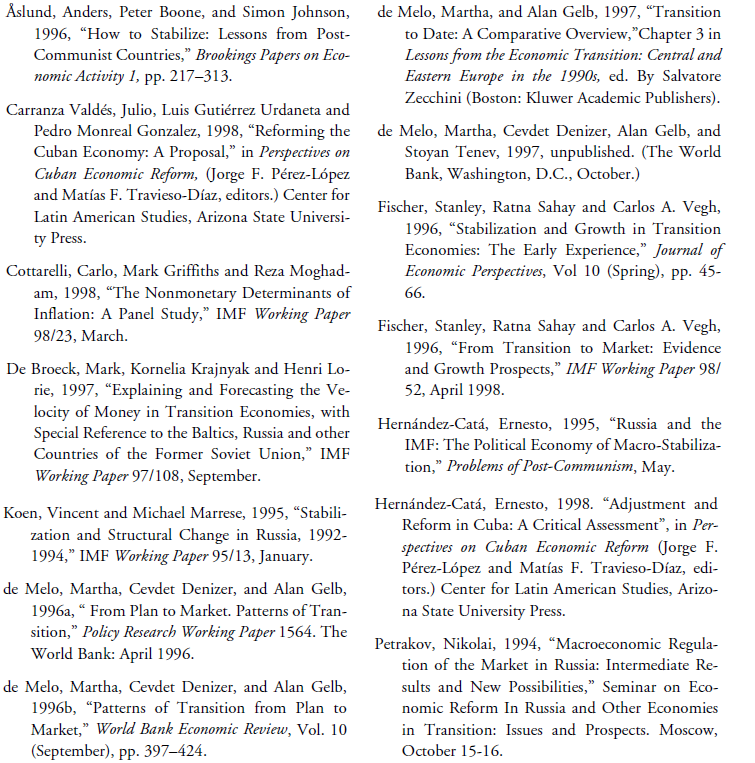 Unless otherwise noted, the index of liberalization used in this paper is the one constructed by a team of World Bank economists and explained in de Melo, Denizer, and Gelb (1996a). See also section on the model below. 5. That paper also contains an extensive investigation of the role of initial conditions in explaining growth and inflation in the transition countries. 6. A few studies have focused on this angle of the problem, but they are unconcerned with the link between inflation and liberalization. See De Broeck, Krajnyak and Lorie (1997), and, in the Russian context, Koen and Marrese (1995). 7. Examples are the support provided by the Central Bank of Russia to the far North and to the agricultural sector in 1992–93. See Hernández-Catá (1995). 8. Consider an economy where a fraction w of all goods is sold at market-clearing prices (P*) and a fraction (1-w) is sold at controlled prices (P). The ratio of actual to equilibrium prices will be proportional to the ratio of controlled to equilibrium prices, i.e. : P/P *= (P/ P*) w. The ratio P/P* itself is inversely related to the gap between actual and desired levels of the money stock—i.e., to the excess supply of money, or ‘monetary overhang.’ It may be noted that the variable V is the structural velocity of circulation of money and is not equal to the ratio of nominal GDP to money except when prices are fully liberalized, as is clear from equation (3). 10. In estimating the equations, the value of the parameter b was set arbitrarily at 0.1. Experimentation with alternative values in the range of 0.05 to 0.5 resulted in higher standard errors. 11. Tests about whether a coefficient differs significantly from zero in the expected direction are based on one tailed t-tests and a 1 percent confidence interval which, for an infinite number of degrees of freedom, involves an absolute value of t greater than 2.33. 12. This result differs from the earlier results of Fischer, Sahay and Vegh (1996). 13. Most of the other dummy variables had to be removed from the equation because their interaction with the set of country dummies resulted in a quasi-singular matrix. 14. Separate equations were also estimated for the external and market entry components of the non-price liberalization variables; the results were very similar to those obtained using the average of those two components. 15. Power consumption is used as a proxy for true GDP, and the difference between real GDP (as imperfectly measured in the national accounts) and power consumption is therefore interpreted as a measure of unrecorded output. 16. In Figures 3 and 4 (as well as in the equations reported in Table 2) the liberalization variables have been multiplied by 100 for ease of interpretation. These variables thus range between zero and 100 while the original de Melo-Denizer-Gelb indexes range between 0 and 1. The estimates underlying the figures relate to the evolution of non-price liberalization and are based on equation 2.4.